An effective cleaner of carpets and upholstery, this low foaming product is suitable for use with either hot or cold water machines. Test a small area for colour fastness prior to use. Vacuum carpet or fabric before commencing cleaning operation. 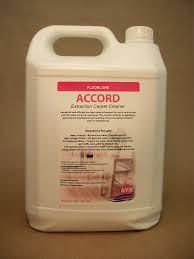 Dilute approximately 1 to 50 with water and add to carpet cleaning machine. Clean carpet or fabric as per machine manufacturer’s guidelines. Brush carpet or fabric when finished and leave to dry for at least six or seven hours. Vacuum carpet or fabric again when dry.